No parent or faculty member wants to think that violence will occur in their own building. Still, school security is a major concern in a lot of districts. There are plenty of systems and products available to curtail school violence and effectively protect students. But some school administrators may be wary about the cost of some of these security upgrades and protective measures. In some cases, they may even feel that these changes are completely out of the question due to budgetary concerns. 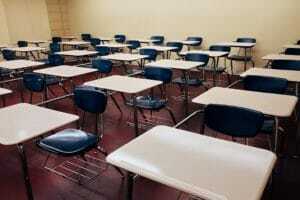 However, school districts do have the opportunity to apply for grants and similar funding programs to help cover some of the expense related to school security products and programs. In fact, the U.S. Department of Justice has made more than $70 million in grants available as part of the STOP School Violence Act. And several states have also offered their own grants and funding opportunities for local school districts. These opportunities may vary depending on your location, type of school, and the specific needs of your building and district. But here’s some basic information about the school security grants that have been announced in recent months. While each grant may have its own specific set of requirements and approved uses, there are a few key areas where grants in the recent federal programs aim to help. Generally, these funds are earmarked for school facility upgrades related to security, faculty and student training, and first responder resources to aid in responding to school violence incidents. Many state and local funding opportunities also focus on those areas. More specifically, there are grants for creating or improving mental health programs in schools, getting necessary resources to first responders near schools, and purchasing bullet resistant systems and similar equipment designed to lessen the risk and impact of school violence incidents. The grants in the federal program are being offered through the U.S. Bureau of Justice Assistance (BJA) and the Office of Community Oriented Policing Services (COPS). They have already begun distributing funds for this year. But it may be worth monitoring those two entities for future grant opportunities through the federal government. It’s also worth searching your state and county government sites for similar funding opportunities that may be available in your area. For example, Michigan State Police recently offered $25 million to school districts around the state for purchasing equipment and technology related to school safety. If you’re interested in learning more about school security upgrades or making changes to educational facilities in your district, the Insulgard team is here to help. Our experienced team can walk you through a number of different bullet resistant product options so you can choose the materials and systems that best fit with your facilities and budget considerations. We can help you put together a custom bullet resistant system for a new construction building or even retrofit protective systems into older schools.